Locust Hill, located in Charles Town, is a golf course community with single family homes, townhomes and villas. 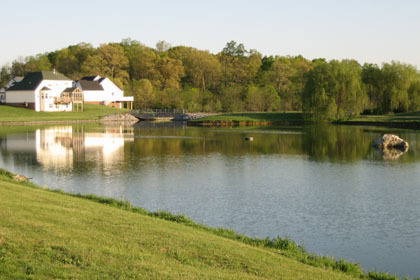 This community of more than 500 homes has breathtaking Blue Ridge Mountains and the manicured golf course for views. Lots are approximately one third of an acre. Convenient to both play and work, Locust Hill residents will enjoy easy access to the high-tech corridor of Dulles, VA, the MARC Train and employment centers along I-270 in Maryland. Listing courtesy of Long & Foster Real Estate, Inc.
Own a Home in This Neighborhood? Whether you're just curious about your home's value or you're eager to sell, we'll use our knowledge of recent sales in Locust Hill to price your home right. Tell us about your home to get started. Please tell us a little about your property. Where should we send your results? Please fill in the missing information below. By giving us your phone number and email address, you are giving The Kable Team permission to contact you via email or phone. You'll Love This Neighborhood's Location! All of the amenities of Downtown Charles Town are just minutes from Locust Hill via a short trip along Middleway Pike. As a resident, you can spend time enjoying all the amenities of Charles Town, or you can take a quick trip to Leesburg, VA, where you'll find everything from major shopping centers to a premier equestrian center. Harpers Ferry is also nearby, giving Locust Hill residents access to all of the natural and historic attractions of the town. Whether you're moving to Charles Town or have been a resident for a long time, we can help you find the perfect home in Locust Hill. Our real estate professionals are natives of West Virginia's Eastern Panhandle, so we have a wealth of knowledge about the area as well as the local housing market. Give us a call at 304-725-1918! © 2019 Bright MLS. The information provided is for consumers, personal, noncommercial use and may not be used for any purpose other than to identify prospective properties consumers may be interested in purchasing. All properties are subject to prior sale or withdrawal. All information provided is deemed reliable but is not guaranteed accurate, and should be independently verified. Web Design by Dakno Marketing.